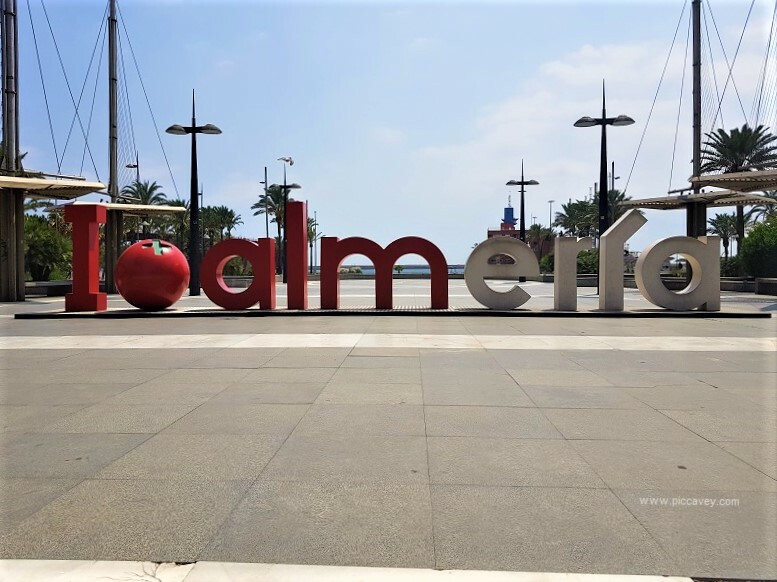 Almeria Spain was just declared Gastronomic Capital of Spain for 2019. The eastern corner of Andalucia is very sunny and where most European produce is grown. Currently Almeria has 31,614 hectares of greenhouses and is often called the Pantry of Europe. 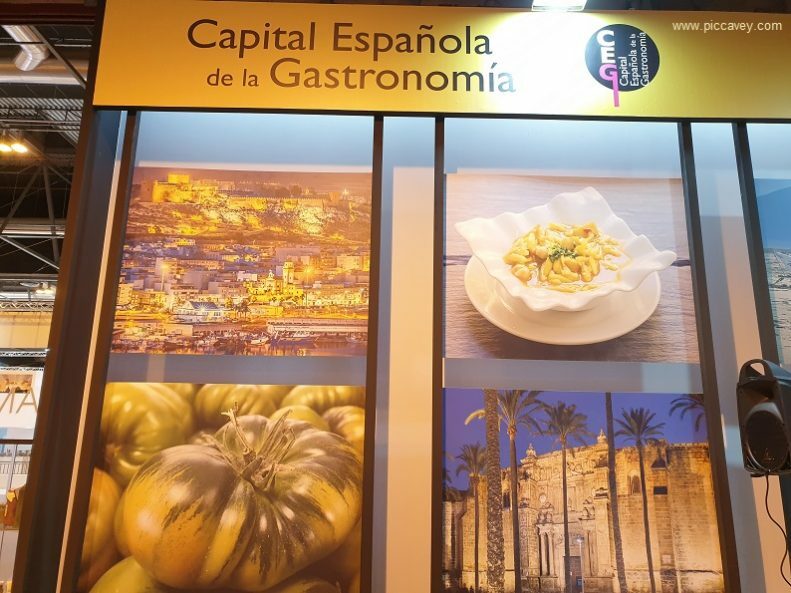 The official presentation of the new gastronomic capital is done at FITUR in Madrid each January. I went to see the hand over last week. 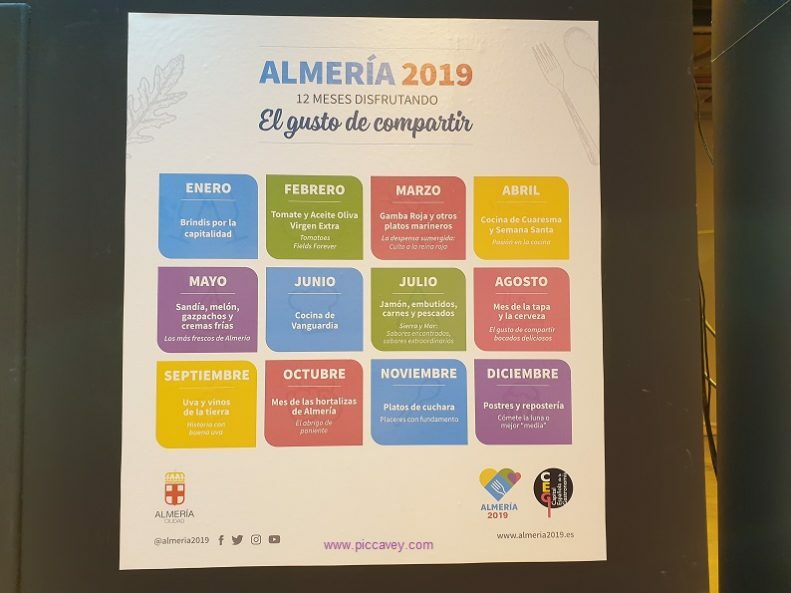 Each month of the year Almeria will have a different theme to showcase their local produce and typical recipes. January is an introduction to the area. February is a celebration of the local tomatoes and Olive Oil. Below is the detail of the other themes. As the area is known for its greenhouses. Some of the most prominent products are tomatoes, watermelons and cucumbers. In December 2018 I visited Clisol in El Ejido which is an important local business. 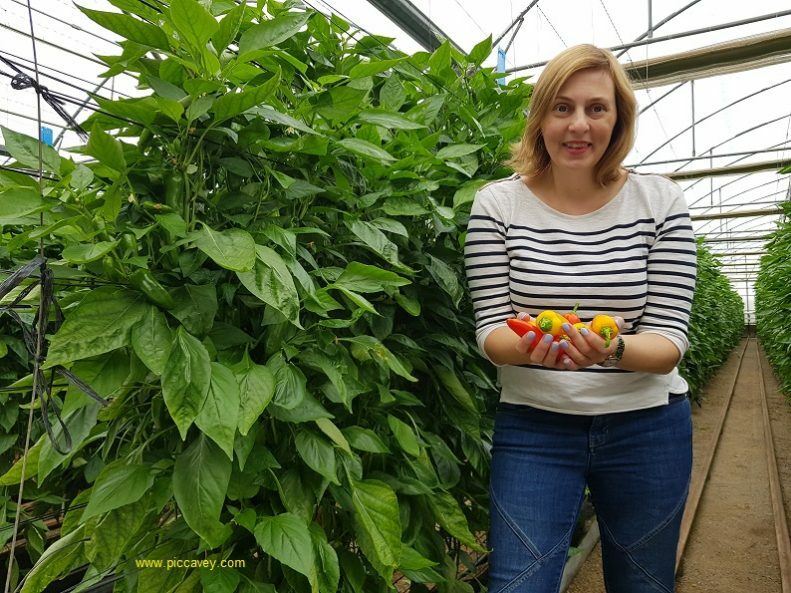 They use Biodynamics to produce peppers, tomatoes and other produce. Using natural pests and bugs to keep plants healthy. It was quite a fascinating visit. Learning about how ants and bugs reacted to different diseases on the crops. This way they solve the problem naturally without pesticides and water contamination. Visiting greenhouses was quiet an eye opener. I expected it to be different. 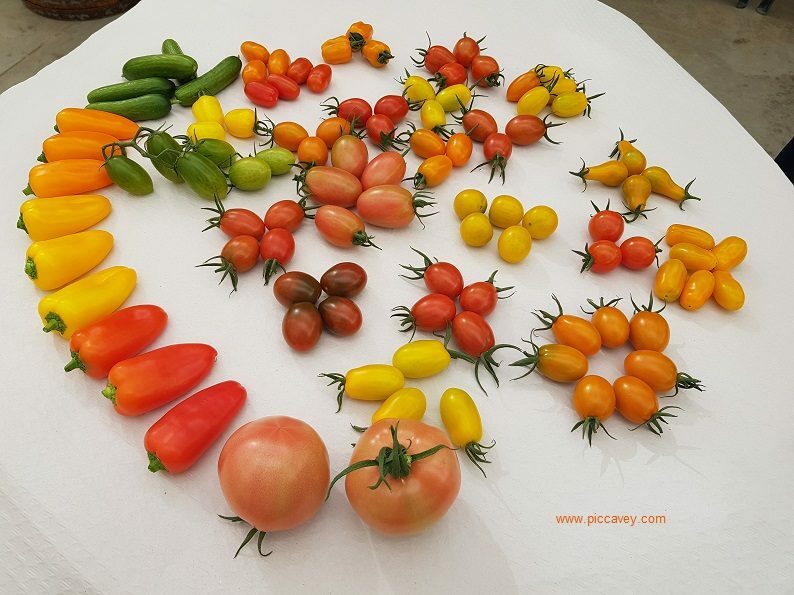 Very orderly and sweet smelling from all the ripe tomates in rows. They use the plastic to control the heat from the sun and open when necessary. Another technique they use at Clisol is stroking the plant to make them become more sturdy. When they are just saplings they brush them to encourage them to grow strong and cope with stress from wind. 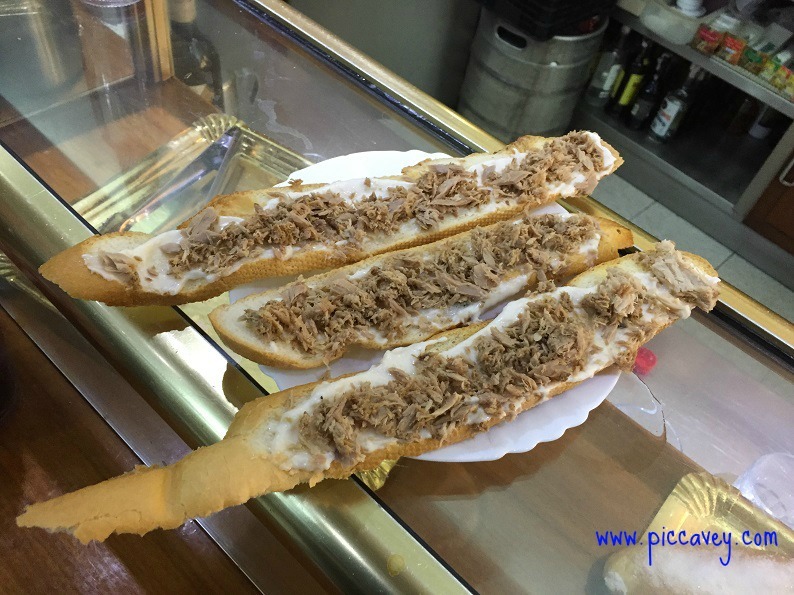 Probably the most popular food in Almeria is the local fish. 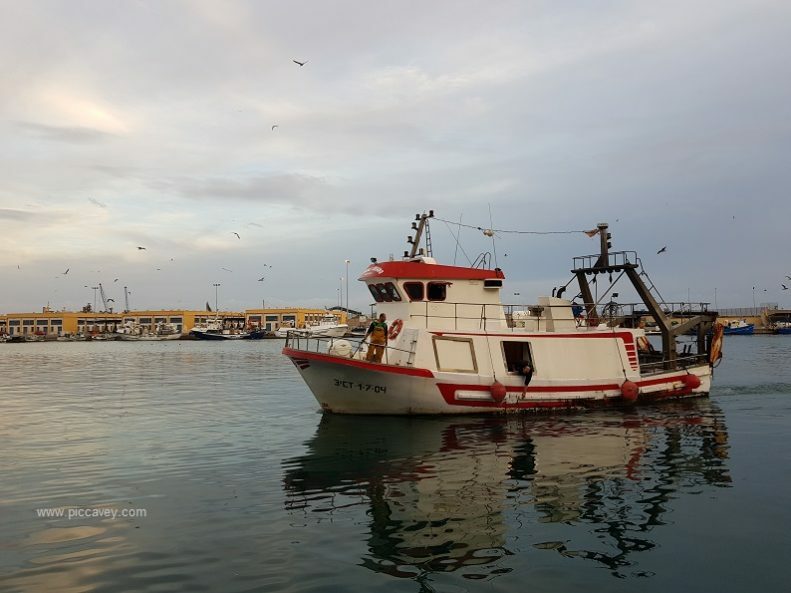 The Port of Almeria has many fishermen going out daily. I went to see the haul coming in at sunset. This initiative arranges sales of fish straight from the dock to your table. It supports the local fisherman. They are also involved in a project to monitor plastic in the sea. Taking note of the plastic they find and bringing it back to port for correct disposal. Inside the auction I saw fresh prawns, monkfish and squid. Octopus and other fish such as galanes were also in the days catch. 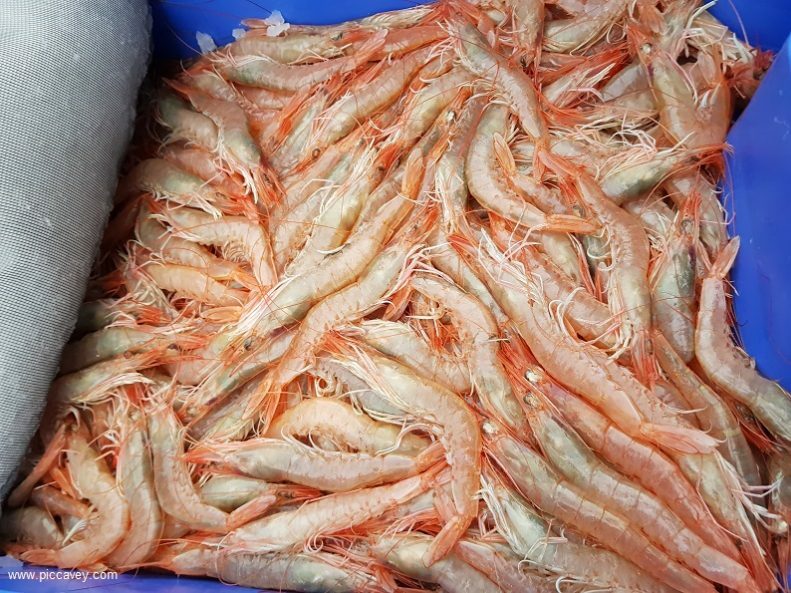 All set out in blue boxes they go up for sale to local fishmongers, restaurants and supermarkets. 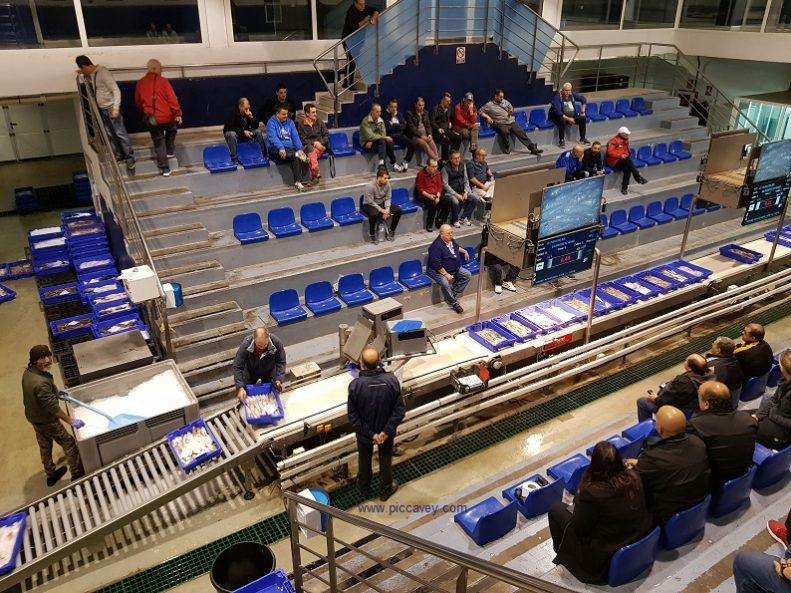 As the blue boxes move along the conveyor belt, a camera zooms in so that the buyers get a good look at the quality of the fish. The boat name is also on the screen too. Once sold they are iced up again. Then picked up by the buyer to go to its final destination. 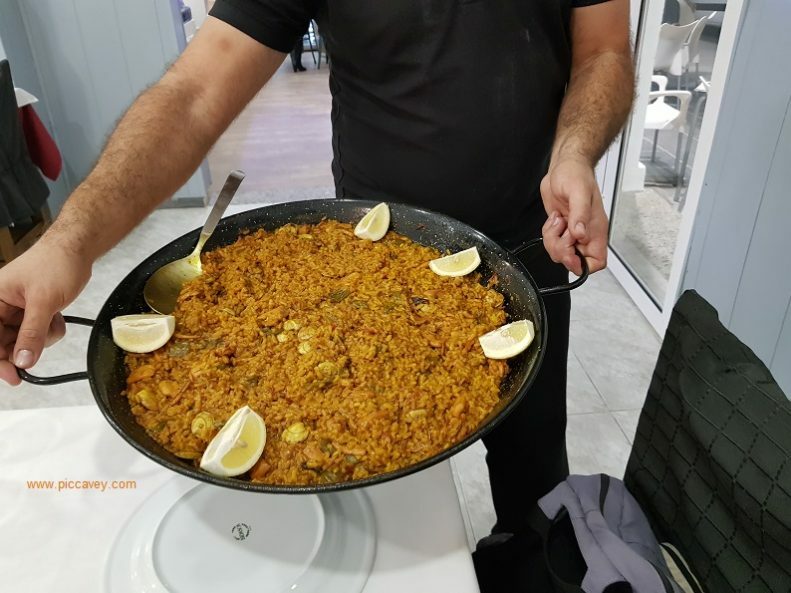 I made the most of my day with the Fishing community by enjoying fresh fish at El Parque Restaurant who served us this fabulous seafood Paella. Local food includes dishes such as Ajoblanco. An almond and garlic cold soup often served with a few grapes. This is perfect for hot days and clearly of arab origin. 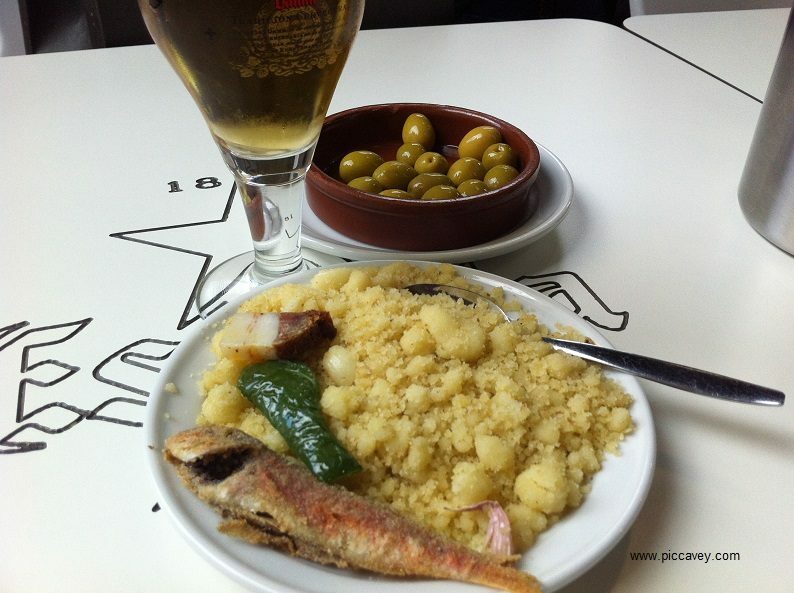 Other typical dishes are Squid in Olive Oil, Gurullos and Ajo Colorao. Calamares en aceite – This is very tender. Slow cooked in olive oil and white wine, with a touch of garlic. Gurullos – A type of pasta usually served with rabbit or chick peas. It is usually a hearty dish like a thick stew. Ajo colorao – A fish stew made with mashed potatoes, dried red peppers and cumin. 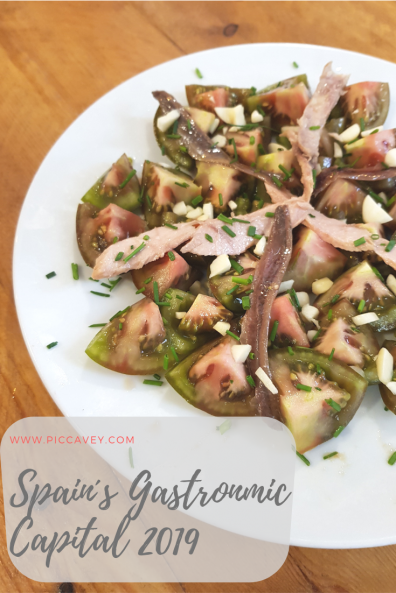 Almeria is also a great city to enjoy tapas. The most popular one is Cherigan. This is a piece of bread with different toppings. Seen above is the tuna one. The original place to eat this is Parilla Pasaje on the main street, but they serve it in other places around town. In Almeria Spain free tapas are served. When you order a drink they offer a complimentary dish. Some have a list of choices, others bring out the tapa of the day for you. Out in Almeria province, the town of Serón has delicious cheese. Look out for this goats cheese called Seronés. It also has some good local wine too. I have tried a white wine called Saetías from the area. Thanks to Tasty Andalucia for arranging the visit to Clisol and the Port of Almeria. The official number of hectares devoted to plastic farms hasn’t appeared to have changed in Almería since around 2002, despite a large and evident growth of invernaderos. a local farmer tells me his sindicato reckons on around 75,000 Ha.